The anterior choroidal artery is said to be as old as the hills. Phylogenetically, the homologs of this artery, which have been recorded under several baffling names in archaic dissections of "lower" species, are well developed in fish, amphibians and mammals. That being the case, do you know what the anterior choroidal artery is and how it affects your health? Many important and crucial anatomical structures of the brain are supplied by the anterior choroidal artery which is also referred to as AChA. The vast variations in the area of distribution and the large area of supply make it important to identify the anterior choroidal artery. 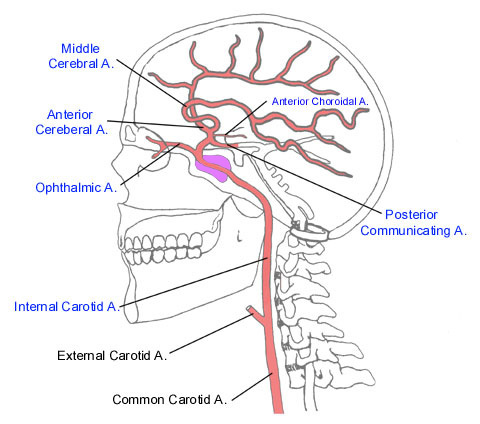 The AChA's diameter is 1 mm and it begins from the posterior wall of the ICA (internal carotid artery) and in between the internal carotid termination that is 2-5 distal to the AChA and beginning of the PCOM (posterior communicating artery) that is 2-5 mm proximally. However, in some instances, it might begin from intracerebral carotid bifurcation, in between the cerebral artery and the PCOM. The anterior choroid artery lies horizontal to the optic tract and to its inferomedial surface, it curves medially. And then it makes another curve laterally that leads to the lateral aspect of the optic tract, circling the cerebral peduncles to get to the lateral geniculate body. It passes through the posterolateral direction on top of the uncus and enters the choroidal fissure. Almost at the end of its path, AChA connects with the posterior lateral choroidal arteries. At present, the best way to see the anterior choroidal artery is through catheter cerebral angiograms. The intraventricular that is the artery after anterior choroidal artery enters the choroidal fissure. The intraventricular segment passes through the choroid plexus located in the anterior part of the temporal horns of the lateral ventricles. Hemiparesis: This is when one side of the body experiences weakness and trouble talking due to weakness of the face. It occurs due to damage of genu of the internal capsule and the posterior limb. The posterior limb has corticospinal tracts that are responsible for moving information about movement from the brain down to the spine. This is the most common symptom of anterior choroidal stroke. Hemianesthesia: This means your sensation decreases on one side of the body, caused by damage of the ventral posterolate nucleus of the thalamus. However, this is not a very common symptom of anterior choroidal stroke and only occurs in about half of the patients. Homonymous hemianopsia: It means patients can't see objects either on the right or left depending on which artery is affected. It is a result of damaging the lateral geniculate nucleus of the thalamus and optical tracts. Anterior choroidal artery syndrome is not a common condition. Infarcts in the area of anterior choroidal artery result in hemianaesthesia, contralateral hemianopia and hemiplegia, which characterize this syndrome. AChA syndrome is also related to neuropsychological disorders, which include disorders of speech in left side lesions and left neglect syndrome in the right side lesions. This syndrome was initially described by Foix Et Al. Paresis and Hemi Plegia is a result of the involvement of the internal capsule's posterior limb. Hemi-sensory loss or hemi-hypoesthesia is a result of involvement of the ventral postero lateral nucleus of the thalamus. The lateral geniculate body's involvement causes hemianopsia. Patients with bilateral AChA infractions experience a syndrome of acute pseudo bulbar mutism. Different lesions and embolism cause differences in the causes of AChA infarct. Small lesions are related to diseases of small vessels, and hypertension is the most serious risk. An embolic source is associated with large anterior choroidal artery infracts. Another cause could be carotid artery stenosis that is linked to younger diabetic males. The cause of AChA infract should be examined carefully because each case is individualized, and thus treatment is prescribed according to the risk involved like embolism or small vessel disease.